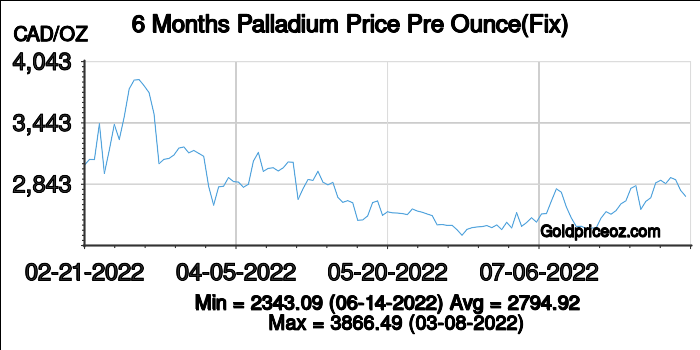 Palladium price in Canada in Canadian Dollar(CAD) per ounce is a free service provided by Palladium Price OZ website, where shows current palladium price(including bid price and ask price) and palladium price history chart(London palladium fixing price). 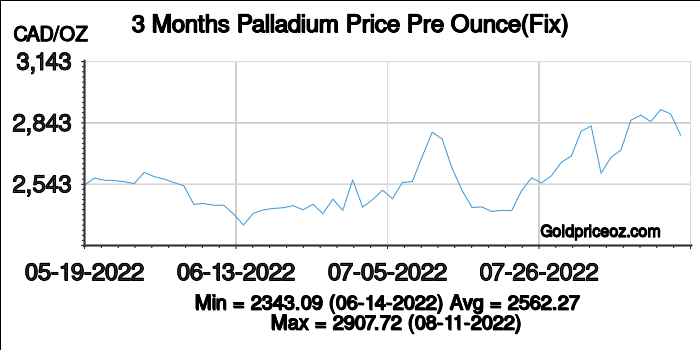 Palladium price in Canada per ounce today is being updated once every 1 minutes. Canada is one of the world's top gold producers. 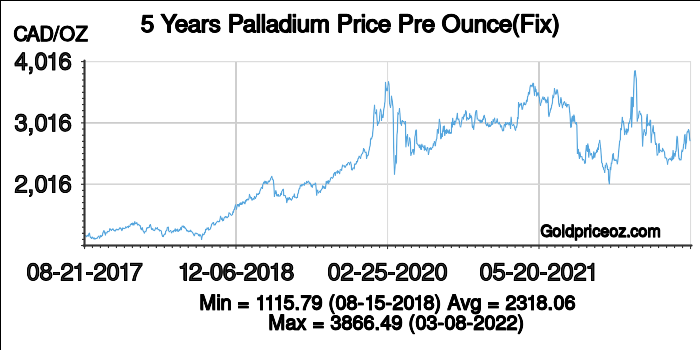 There are lots of mining companies in Canada; the major mining companies include Placer Dome, Barrick, TVX Newmont Americas (TVXNA), Miramar Mining, Kinross Gold, Newmont and Cambior. By merger of Barrick and Homestake generated one of the world's largest gold mining companies. 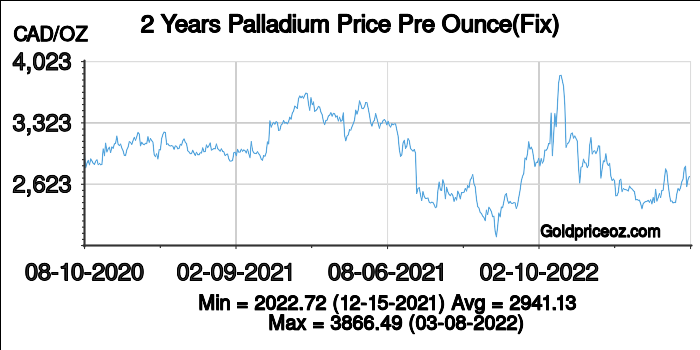 The Winnipeg Commodity Exchange (WCE) is the only agricultural futures and options exchange, located in Winnipeg, Manitoba, Canada. In 1887, the Winnipeg Commodity Exchange was established as the Winnipeg Grain Exchange, and its name changed in 1972. 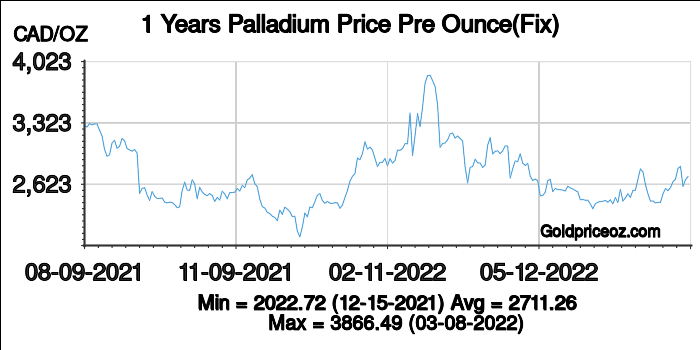 In November 1972, the Winnipeg Commodity Exchange opened the Winnipeg Gold Futures Market. In December 2004, WCE became North America's first commodities exchange to utilize a trading platform that is entirely electronic. In September 2007, the WCE became a subsidiary of the Atlanta-based IntercontinentalExchange (ICE). Now, its quotes are traded on the ICE platform. The Canadian Gold Maple Leaf is popular for gold investors. It is the official bullion gold coin of Canada, produced by the Royal Canadian Mint. Its purity is 0.9999 millesimal fineness (24 carats). The weights of Maple Leaf coin are in 1⁄25 oz., 1⁄20 oz., 1⁄10 oz., 1⁄4 oz., 1⁄2 oz., and 1 oz.